I have been busy in the studio preparing for my upcoming shows and find myself working on a new piece on a canvas measuring 16″ high by 40″ wide. After the canvas has been prepped with multiple layers of gesso and a layer of black paint, I compose the painting by laying in the elements of the picture in red oxide paint. This is my favorite part of the process, the time when I can just let my mind fall into the picture and roll around all the possibilities that it offers. Every stroke is a decision and most are made instinctively, letting the surrounding elements and the underlying texture dictate the next move. 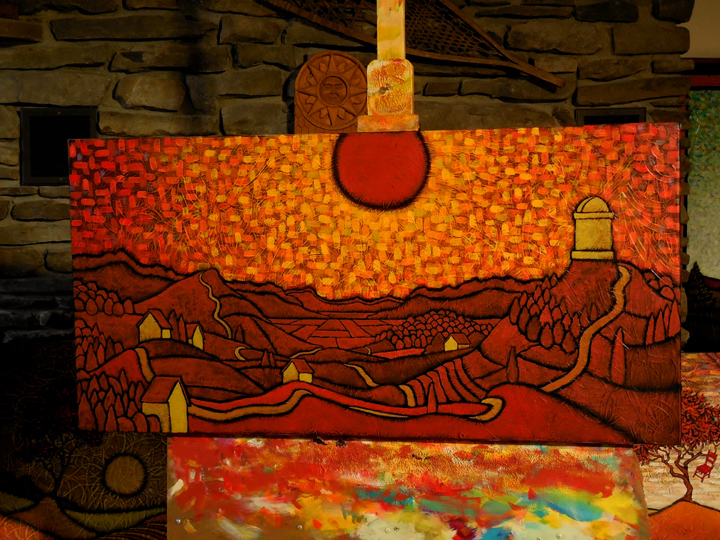 As the piece progresses, the painting takes on its personality in a warm glow of varying reddish tones. At this point I decide where I want to place the focus for the painting. Here I want it to be all about the sky. Painting the sky at this point is not always the norm. Sometimes I go to work on the landscape first, letting it tell me how I will treat the sky. But on this piece the sky comes first, so I begin to lay in colors radiating from around the sun. Or moon. Nothing is really set in stone- or paint-at this point. As the sky progresses , I veer off momentarily to lay in a little color on the houses and the flat fields that occupy the middle of the painting. I am now at a point where I still have work to do on the sky but the painting is beginning to speak plainly to me. I know what it is and have a fairly good idea of where it can go. I say fairly good because there is still a lot of decisions that will affect the final version. The colors of the landscape, for example, and their intensity and tones. I am almost always at my most deepest level of infatuation with the piece when I am at this point in the process. The moodiness of the red tones have a shadowy effect that pleases me, that makes the sky contrast a bit more than it may after the colors of the landscape are added. I find myself asking this morning if I should forgo the colors I normally add and focus on creating a tonal composition based on the red oxide. It would be a darker piece than my normal work but if it works as I hope it might, it would carry that feeling that always hooks me as I am working. So this morning I am sitting here looking over at the easel and deciding if I will spend the day in bright color or in shades of russet. This is one of the new pieces I have been working on. I wasn’t sure I wanted to show it in this state, as it is unfinished, or even when it is finished. But as it progressed it began to grow on me and was meeting my expectations for what I wanted from it. So, I thought I would show it and talk a bit about this piece, a 12″ by 24″ canvas that I tentatively calling Frank the Icon. The idea for this came about from my admiration of religious icon painting and something I read in the foreword of a David McCullough book I recently started reading. In it McCullough talked about history , while being documented in large and grand acts, often turns on the actions of ordinary people doing small but significant things that inspire or lead others to do those greater deeds. It made me wonder who these people were today whose everyday deeds would help rewrite our future history. 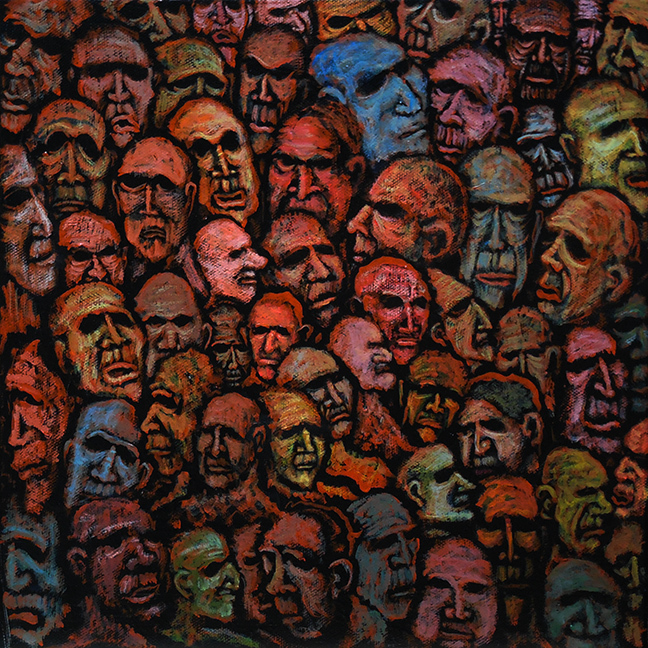 I thought it might be interesting to show ordinary figures painted in the style of an icon but in my own style of painting, And that how Frank came about. Early on, I was underwhelmed by this piece and could feel the effects of my recent absence from painting. But midway through it began to pull at me in a way painting sometimes does for me, urging me on with small hints at what might be ahead. It was an excitement I haven’t felt in a while and it felt very good indeed. I truly wanted to see what was coming. There are many things I like about this piece. Even though I will admit to it being flawed ( as are most of my paintings) there is something in it that makes it alive for me, something that speaks to inner parts of me. It has a real presence here in the studio and it is easy to engage with him as I walk around and the gold halo seems to push his countenance forward even more. Cheri came into the studio and after looking at it asked why I hadn’t painted bolts on his neck. She said he reminded her of the Frankenstein creature. I could see that as well and thinking about it made me realize that there was something to this idea of an icon with beings that were capable of beings both gods and monsters. That’s where the quote from Mary Shelley’s Frankenstein came in. It is compelling and fitting, this idea of a naive creature who suffers the suffering and misery of being a lone being in this world, finding comfort in experiencing anew the beauty of this world that we who know it so well often take for granted. It even speaks of the halo. Sometimes I am a little hesitant in showing certain paintings here on the blog. Sometimes their photographed images just don’t fully convey the impact or depth of the work. Take the painting shown above for an example. Titled The Animating Presence, it produces a strong initial impact with its large size– 20″ by 60″ on canvas— and its deep colors and textures. The photo captures the colors (although not the depth within the colors) and a mere fraction of the texture but the power in its size is lost on the smaller screen. It is still a strong image but most people would be surprised at how truly different the actual painting comes across in person. I showed this painting here a few months back in an early stage, shown now at the bottom. The landscape was laid out in the red oxide paint I use for my underpainting and the sky with its first several layers of color, the emotional atmosphere of the piece beginning to take shape. Many, many more layers produced the sky as it now looks above. There are layers that are almost completely obscured, perhaps with only a tiny glimmer of it coming through here and there. Looking at it, you may not be aware of it but its presence is vital to me, giving the whole thing the depth and life force that I seek in it. And maybe that last sentence is a good way of explaining the title, The Animating Presence. The more I worked on this piece, the more I began to feel as though the Red Tree was in some sort of communion with a greater power in this painting, represented by the light breaking over the horizon. This is always a hard thing to explain for me. As I have explained in the past, I was not brought up with religion of any sort. I was never indoctrinated in any sort of system of faith, never led to have either belief or disbelief. I was just here, neither a believer or an atheist. But looking at the world I had a sense that there was something more, some unseen source of power that sparked all life and consciousness. It wasn’t a benevolent god sitting on a throne in some heaven pulling the strings on human events and listening to our prayers. No, it was more a matter of physics and light and energy, an unseen force that permeated everything– an animating presence. Now, a couple of hundred words can’t really sum up the whole of what I am describing or even what I see in this painting. But it is this struggle to come to terms with this idea of that presence that I see in this painting. That like those unseen layers of paint in the sky which give depth to the painting, one’s life is given meaning by an unseen force that we may never fully know or understand. When I finished up in the studio yesterday, I was at this point in progress on a new painting. It is a 20″ by 60″ canvas that was started with only the thought that it would be curtained in by two layers of tree trunks on each side. The basic composition of the entire piece is laid in in an underpainting of red oxide and there are a numbers of layers of color in the sky, beginning to give shape to the tone of the painting. It has definition and purpose now. A forseeable destiny. This is one of my favorite stages of my process. The bones and form of the painting have been created, the decisions concerning composition made, and the painting begins to stir to life. There is a keen sense of sharpness to it at this point, as though the essence of its being has been boiled down and captured in this layer of red oxide paint. Like a revealing of its soul. The layers that will follow will give detail and nuance to round out its wholeness. It’s interesting to watch it go from this sharply defined revelation of self through the series of transformations brought on by each subsequent layer of color. There will be points when this sharpness will fade completely away, leaving the piece dull and flat–barely alive. Sallow. Like a patient on a respirator. At that point, I sometimes finding myself questioning my prior decisions and asking if the piece will ever come back to life. This comes near the end and, disheartening as it sometimes is, would be my least favorite part of the process if not the fact that I have the knowledge of and confidence in what will soon take place on the canvas. The layers of color come quicker and consist of fewer strokes but each small move now seems to bring more and more of a change to the piece. The soul of the painting that once filled the canvas in the completed underpainting above now begins to reveal itself again in its fullest form. Now, that being said, it what I hope happens. Sometimes it just doesn’t. But sometimes the soul of the piece is revealed so strongly at this point that it will not be denied. Once in a great while I show my works in progress here on the blog. I ‘m never too excited about it because in many of the stages that are shown the work still lacks that thing, that completeness, that gives it life. But there is a point earlier in the process where it does attain a certain sense of completion. It’s right after the initial blocking in of the painting with red oxide paint and after the the first layers of color have given the beginnings of light to the sky. It has a mood of its own at this juncture, a direction and a sense of the life it will have. Outside of the final moments near the completion of the moment, this is by far my favorite stage of the process. After this, as more layers of color are added, it devolves for a while, becoming flat and dull on the surface. It loses any brightness. Without this early glimpse of what it might be, these later stages might be discouraging. This early stage is one where I sometimes find myself wanting to stop, to go no further and just let it be as it is. But I always seem to push past this and move on to the fuller version that has more color and a bit more polish. I may show a few more stages along the way until the final version emerges. By the way, this a 24″ by 48″ canvas. Being Sunday morning, it’s time for a little music. I have had an old Burt Bacharach song in my head for a few days, one from his heyday with Hal David where they churned out an amazing string of hits for Dionne Warwick in the early 60’s. His music always has a distinctive sound and feel. There is a coolness and lightness in the sound of much of his music that I can’t fully describe and Warwick’s strong but delicate phrasing fits it like a glove in these songs. I guess that’s why it sticks in my mind so well. Here’s Walk On By from Dionne Warwick. A little coolness for what I hope will be a great Sunday for you.